Is it possible to get the new Hobie colors for the Hobie 14 Turbo? and this for Australia too. Sails easily yes - just depends on the material colors they have on hand. Might take a while and will certainly be more $$$. Hulls - I think all the hulls are made in Europe. Would take a long time and a lot more $$$. Anything's available - just depends on how much money you want to spend. Wondering if the new 16 sail colors are available for the 14 or do they have to run out the Coronado sails out first? 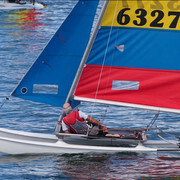 You can order custom sail colors for the Hobie 14. The new colors will not be available for use, on anything but new boats, until next fall.